Bone broth is essentially bones and vegetables simmered together over long periods of time to produce a rich flavoursome liquid. 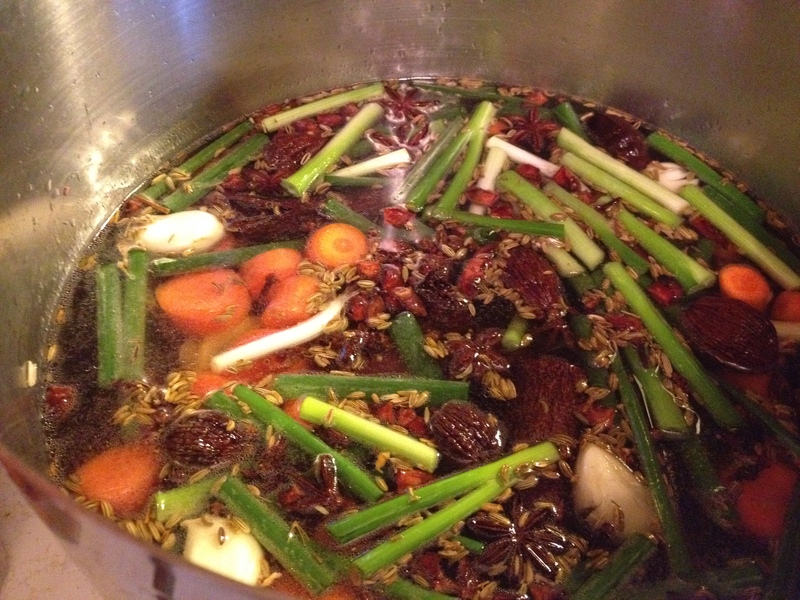 I make a big pot of this nourishing broth weekly, and it’s an important part of my healing regime. 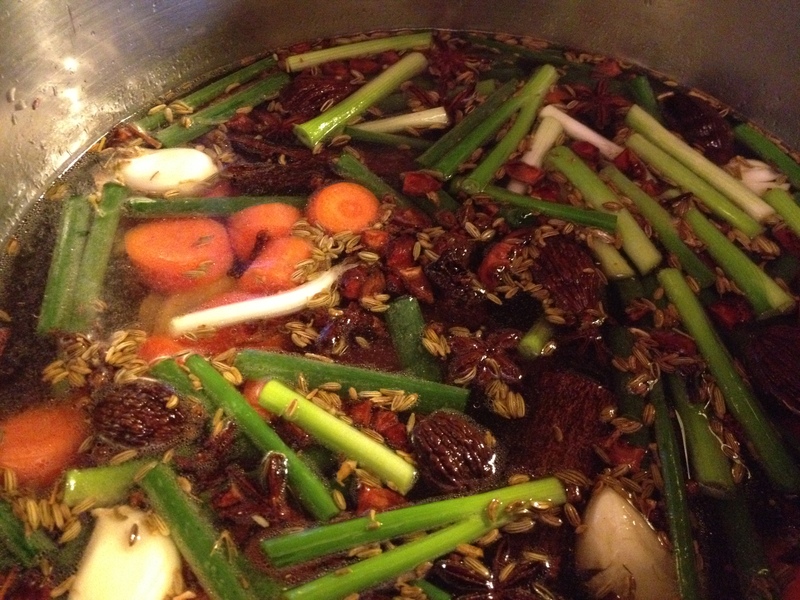 I’d always made my own stock, but after I began to understand the benefits of consuming bone broths I made them much more central to my regular meals. Maybe you should too! Bone broths are full of collagen, gelatin, glucosamine and chondroiton. These substances will plump up your skin and make your hair and nails strong and healthy. More importantly they will rebuild connective tissue, reducing pain and inflammation while promoting healthy functioning of joints, bones, blood, nerves, muscles, brain and organs. 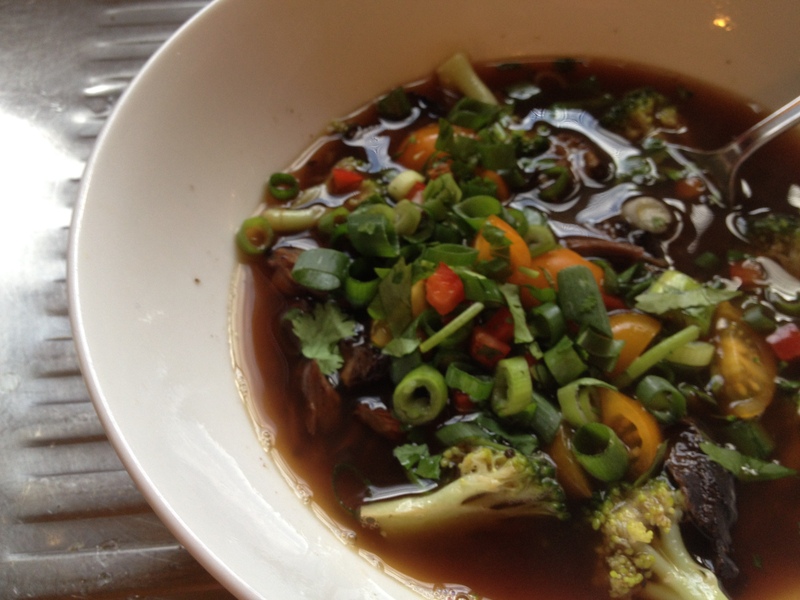 Bone broths promote healing and slow the aging process. 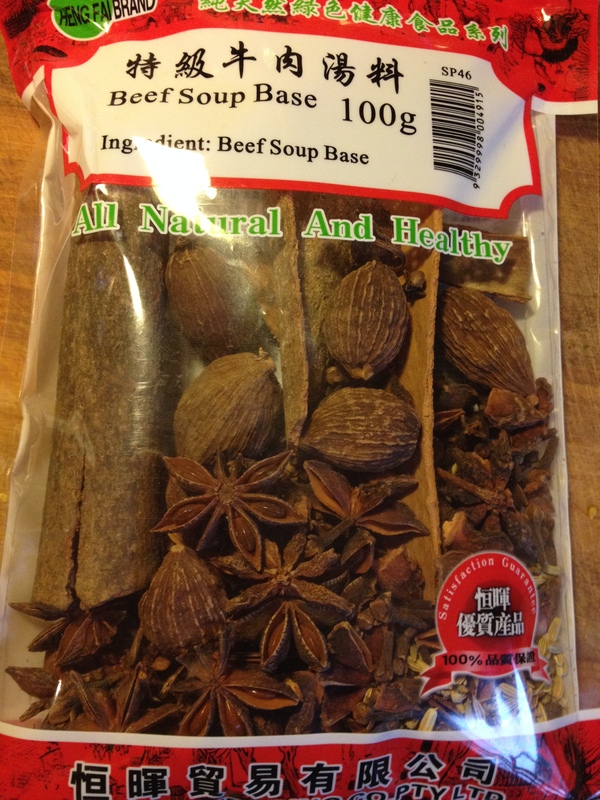 Bone broths are great for the immune system – building it up and making it strong. They are rich in fat and water soluble vitamins, enzymes, and amino acids. 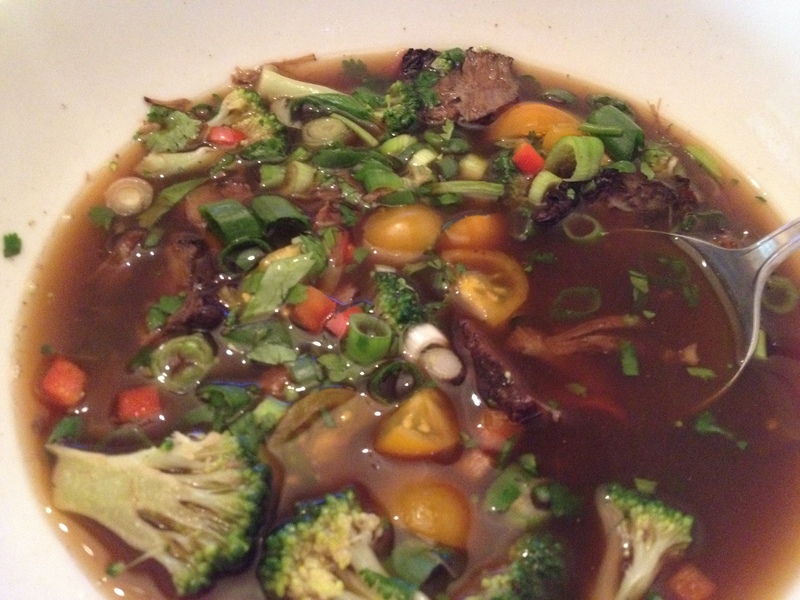 More on the good stuff in bone broth here. They are easy to digest, and actually aid the digestion and assimilation of vegetables, meats, grains and legumes. Bone broths heal the mucosal membrane of your gut – so it’s great for anyone with Chrohns, coeliacs, IBS, ulcers and other digestive or bowel issues. 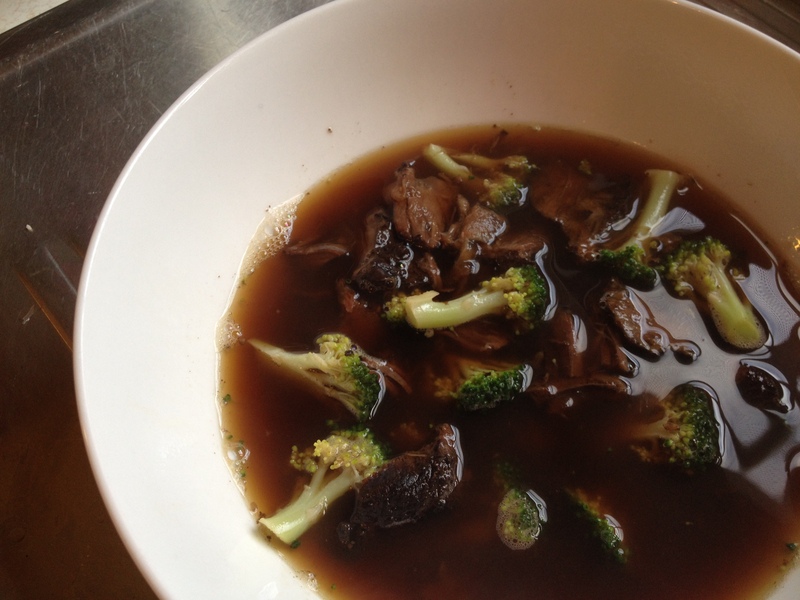 Bone broths also support healthy metabolic and thyroid function. Raw bones of beef or veal, or fish or chicken carcasses. A few tablespoons of apple cider vinegar (or whatever vinegar you have to hand). Water. Herbs of your choice and a mix of vegetables such as carrots, onions, celery are optional but advisable for depth of flavour and added nutritional value. 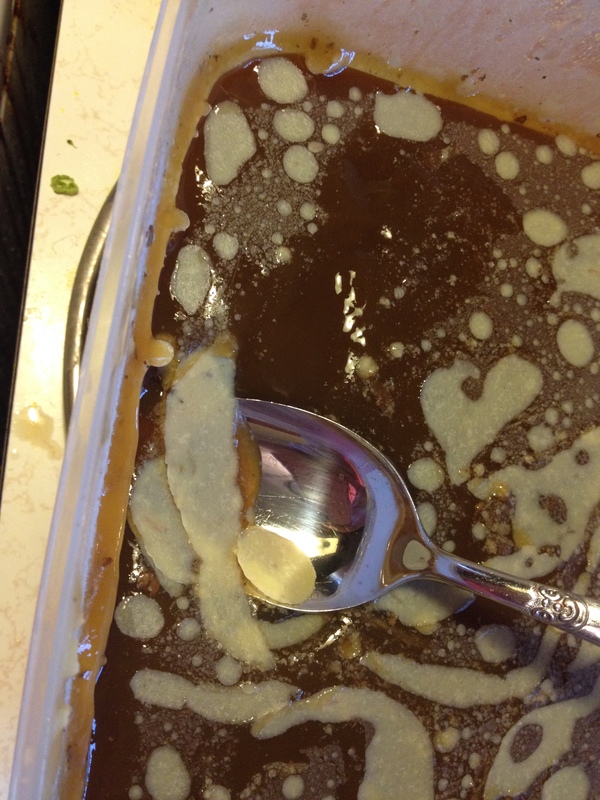 Today I’ll share my beef bone broth recipes! 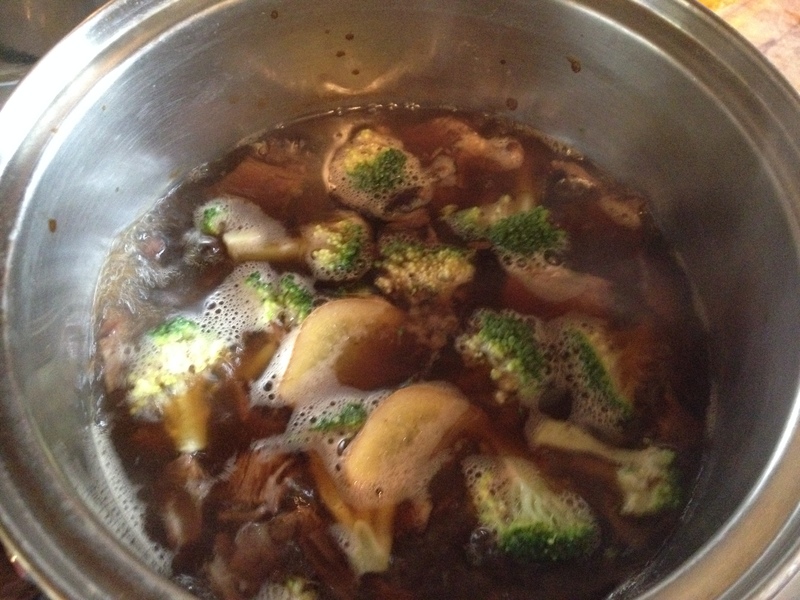 I have a standard stock recipe, and one with an asian twist. They’re easy so I’ll include them both. 2 kilos of beef bones (preferably organic and grass fed – bones aren’t expensive, so do your best to get good quality raw material for your broth! ), 2 tablespoons of coconut oil, 2 tablespoons of apple cider vinegar, 3 to 4 litres of water. To your beef bones, water and vinegar add 3 carrots roughly chopped, 3 garlic cloves crushed with skin still on, 2 large brown onions – skin on and cut in wedges, 4 sticks of celery roughly chopped, 1 large bunch of parsley, one dried bay leaf, 6 cloves, 12 to 15 peppercorns. To your beef bones, water and vinegar add 3 carrots roughly chopped, 3 garlic cloves crushed with skin still on, 2 large brown onions – skin on and cut in wedges, one inch of fresh ginger – thinly sliced, a small bunch of shallots/green onions/scallions roughly chopped, one packet of Chinese beef soup base herbs or 6 star anise, one dessertspoon of fennel seeds, 2 or 3 large curls of cinnamon bark, 1 strip of orange peel (no pith! ), 6 cloves, 12 to fifteen peppercorns. One to two tablespoons each of Tamari (wheat free soy sauce) and sherry or Chinese cooking wine (optional) to finish. Rub your bones with the coconut oil and place in a hot oven for about an hour until they are well browned. This caramelises the proteins and gives a beautiful rich flavour to your broth. Use the same method for chicken carcasses. Don’t bother for fish. Place the bones in the bottom of a big cauldron or slow cooker. Then deglaze your cooking pan with some hot water to get all of those delicious juices and flavours off. 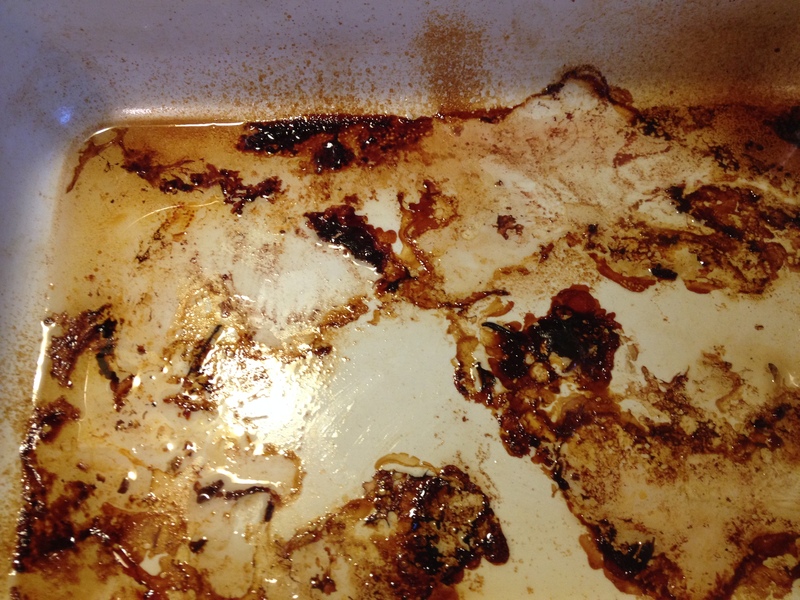 Tip in your hot water and rub the bottom of the pan with a wooden spoon until the cooked juices lift and soften. Pour all of this over your soup bones. Bring the ingredients to the boil. Then turn down the heat and wait for the magic to happen. Cover and simmer slowly for a minimum of 12 hours. Top up with a little extra water if needed. 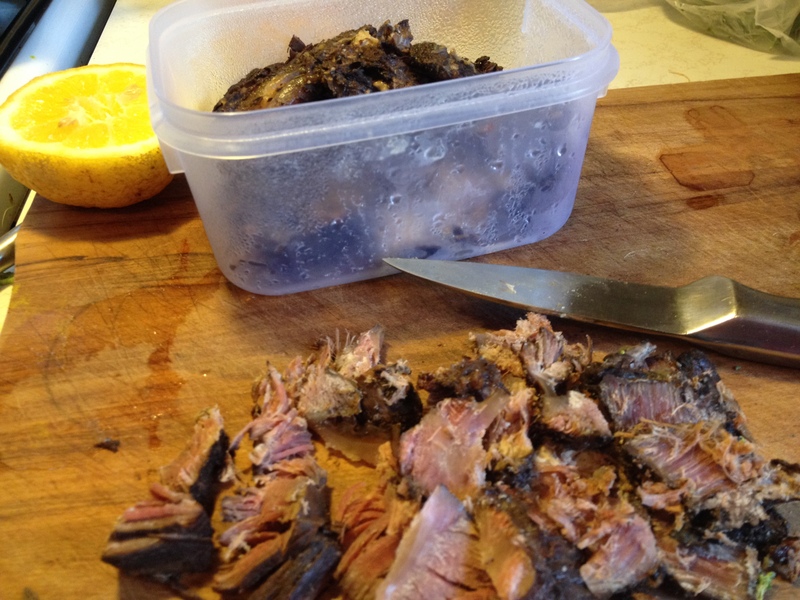 I usually cook my bones broths for 24 hours – sometimes more! Turn off heat after allotted time and add tamari and sherry/cooking wine. Allow to cool. Then strain off liquid and refrigerate. You can also batch the broth and freeze it. When the broth is cold you may choose to scoop the fat off the surface. It’s easy to do. What’s left behind will be a rich, gelatinous liquid – more jelly than soup. That’s all of that good collagen and gelatin enriching your broth, that will soon be enriching you. You may also want to pull any meat from the bones and store in fridge for use in soups, omelettes and stir fries. The meat will be stringy while hot but once it is chilled it will slice beautifully. Here’s my standard breakfast bone broth. I add a generous cup of cold bone broth to a saucepan, along with a handful of cold meat and broccoli florets (or whatever other green vegetable I fancy). For extra flavour I often pop in a slice or two of fresh ginger. I simmer this for two or three minutes. Removing the ginger I tip the broth into a bowl. It’s ready to go! Or for an added nutrient boost add a handful of chopped fresh herbs and vegetables such as tomato, capsicum (bell pepper) coriander and shallots/green onions/scallions. This is a delicious easy meal at any time of the day! Bone broth can also be drunk on its own, or added to soups, gravies, casseroles or any other recipe where you would use stock. Hint: If you decide to make bone broth on a regular basis keep all the vegetable offcuts you would normally put in the compost from your shallots, carrots, onions, celery, beet tops etc and store them in a container in the fridge until you’re ready to use them. The carcass of your roast chicken or the lamb bone from your Sunday roast will also work well. Don’t be afraid to experiment! 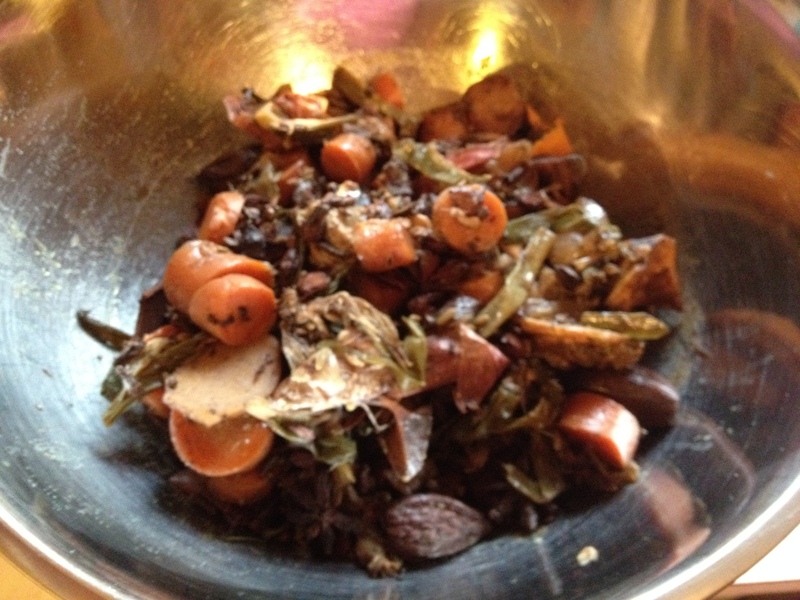 This entry was posted in Gluten-free, Invalid Cooking, Slow Food, Soups and tagged basic stock recipe, beef bones, bone broth, bone broth recipe, easy bone broth, easy brown stock recipe, healing soup recipe, Nourishing Traditions bone broth, paleo bone broth by Cauldrons and Cupcakes. Bookmark the permalink. I had no idea about the roasting and vinegar. Can’t wait to start making this. This is probably the most useful recipe you have posted. I agree up and old with no basic cooking skills. That is grew up…thanks auto correct. 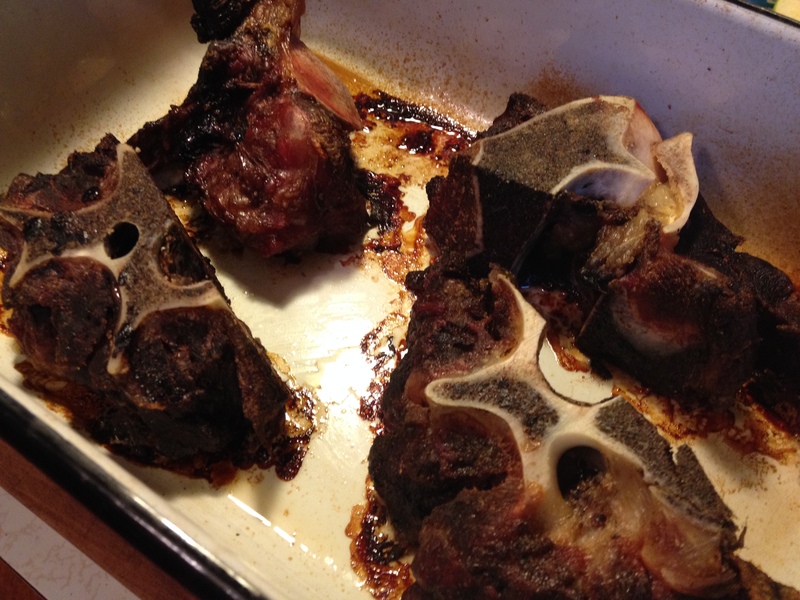 WOW looks so good and those are no ordinary bones …they have meat…looks like some delicious oxtails…thanks for the recipe it just what I’ve been wanting and I had no idea of all the nutritive and curative values of bones. Do Harry and Bert get to eat them after you are finished? I believe that the acid of the vinegar leeches the Calcium (& other nutrients) from the bones which makes it a powerhouse source of necessary stuff for our bones. For me grateful acknowledgment to the animal that gave it’s life for ours and calling on all positive healing powers to infuse their energies into the elixir are essential elements to the process… – kinda gathering you would automatically do all that ‘witchey-poo’ stuff Nicole! Hi there….I want to ask if making this broth with chicken bones that were already cooked as in rotisserie chickens would be ok? 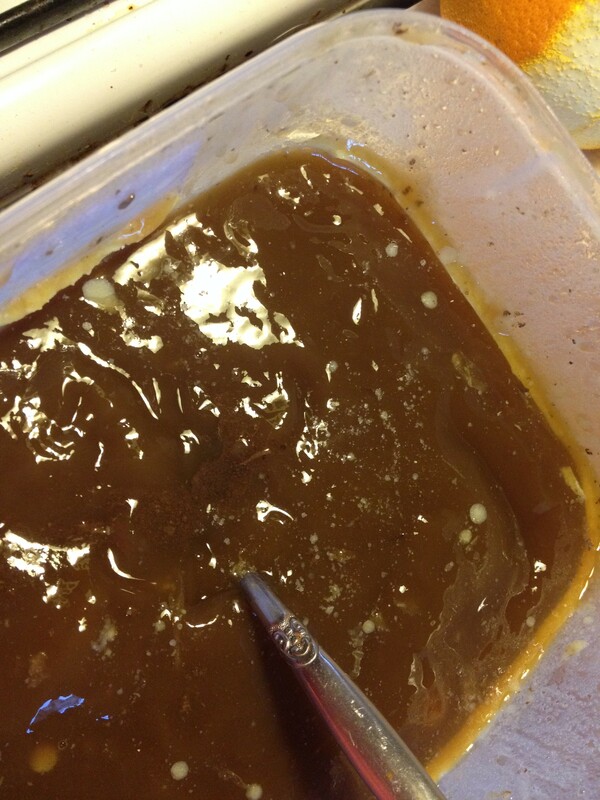 I did it but not sure….it got a jelly like consistency after a few days in the fridge…is this the collagen?